ROH officially announces the main event of Final Battle, SmackDown's viewership, Nick Diaz close to finalizing a return to fight, huge MLB television rights extension & more. **Our weekly Café Hangout show is available for Double Double, Iced Capp & Espresso members of the POST Wrestling Café. On today’s show we were joined in studio by Martin Bushby from the British Wrestling Experience to chat the UK scene, the role of NXT UK and its impact, the future of Progress & ICW, the first season of World of Sport, the WWE’s upcoming television renewal in the UK and lots of other topics covered. **This week’s edition of upNXT with Braden Herrington & Davie Portman is up on the site with the two reviewing the final episode of NXT before TakeOver and make their predictions for the show this Saturday. The show can be downloaded from the main page and subscribe to upNXT on iTunes and catch the TakeOver POST Show this Saturday night on the site. **On Friday, we will have our monthly MCU review with Wai Ting & I reviewing Thor from 2011. In addition to reviewing the movie, we will be joined by Brent Chittenden of the True North Nerds podcast to discuss the life and legacy of the late Stan Lee. This show will be available for members of the POST Wrestling Café. **Dave Meltzer reported this week in the Wrestling Observer Newsletter that the decision to put the WWE title onto Daniel Bryan was made last weekend prior to Becky Lynch’s injury. The rationale for swapping Brock Lesnar’s Survivor Series opponent is unknown and leaves Styles without a spot presently for Sunday’s show. Meltzer went on to add that Bryan has been pushing for a heel turn, but the decision to execute the turn in concert with the title change wasn’t decided upon until Tuesday afternoon when McMahon made the decision to do both. It could be argued that if the decision to put the title on Bryan was known, an angle could have been set up the night prior on Raw to build up Tuesday’s audience rather than a two-hour build on the show. There was an easy story of Styles showing up on Raw alongside Bryan to push their respective Survivor Series matches and still being manipulated by Paul Heyman to have the title match, only Lesnar would be present to state he will fight the winner on Sunday. That said, SmackDown still did well (read below) with their largest audience since the 1,000th episode. **Tuesday’s episode of SmackDown Live averaged 2,312,000 viewers on the USA Network, an increase of 10.7% from last week’s figure. The show had added attention with the news breaking that day that Becky Lynch would be off the Survivor Series with curiosity how it would be handled. On top of the Lynch story, they set up a WWE title match between AJ Styles and Daniel Bryan in the first segment resulting in a rare title change on television. It was SmackDown’s highest number since the program’s 1,000th episode last month and prior to that September 4th. 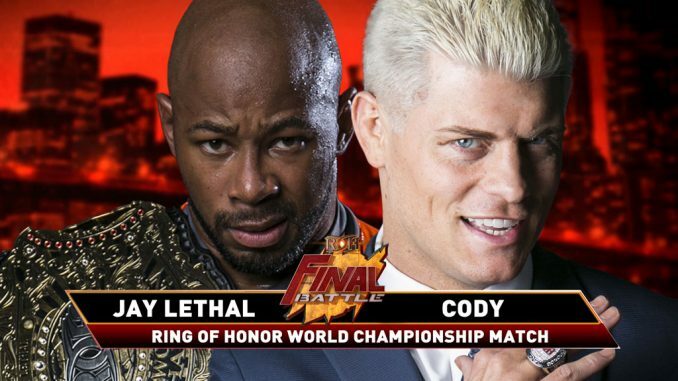 **Ring of Honor officially announced that Jay Lethal and Cody will headline Final Battle on Friday, December 14th from the Hammerstein Ballroom. Cody is stating it’s his final match and will take the title into free agency, so it’s their version of the Money in the Bank 2011. They have also announced Matt Taven will take on Dalton Castle. **The authorities in Saudi Arabia are seeking the death penalty for five of the 11 individuals believed to have carried out the actions of killing dissident journalist Jamal Khashoggi last month. Saudi Arabia public prosecutor Saud al-Mojeb released his findings stating that the Crown Prince Mohammed bin Salman had no knowledge of the plan and that the orders to kill Khashoggi were made by “low-level officials who disobeyed orders and acted on the fly.” This theory goes against the one laid out by the Turkish authorities, who stated it was planned out in advance and Turkish President Recep Tayyip Erdogan said publicly it came from the highest levels of the government in Saudi Arabia. **Fox Sports and Major League Baseball have announced an extension to their television rights deal. The deal in place was to end after the 2021 season but the extension will take the relationship through 2028. Bloomberg reporter Scott Soshnick states that the extension is worth $5 billion over the additional seven years of the deal. The new deal won’t take effect until 2022 and will include additional regular and postseason games on the Fox network while retaining the rights to the World Series, LCS, and All-Star Game. The MLB coverage will be a factor for the WWE next year once they begin airing SmackDown on Friday nights and will inevitably face playoff conflicts where I would assume SmackDown would be moved to FS 1 when there is baseball competition. DAZN and MLB are also expected to announce a three-year deal where the upstart streaming service will have the ability to air live cut-ins during their baseball studio show. **Wednesday night’s episode of Total Divas saw the show hit its second-highest number of the season with 412,000 viewers on E! It was their highest figure since the season premiere on September 19th. I saw blood on Dana’s face so I stopped from hitting her & also was being told to get a doctor and ref because of what just had happened to Becky. We are out there fighting to win but not out there to legitimately hurt one another. **Ryan Satin at Pro Wrestling Sheet is reporting that Enzo Amore (Eric Arndt) was removed from a flight due to vaping. The flight was headed to Los Angeles from New York and he was removed after not listening to instructions when he was told to stop vaping. **A scheduled WrestleMania On-Sale Party hosted by the WWE tonight has been canceled. The company is citing “impending inclement weather” for the cancelation. The event was designed to promote tickets going on sale for the show at MetLife Stadium and was to feature several matches, including Zack Ryder & Curt Hawkins teaming up. The pre-sale for WrestleMania tickets began Wednesday and tickets will be available to the public beginning Friday at 10 am Eastern. **Mike Johnson at PWinsider.com is reporting that Giancarlo Dittamo, who was behind a lot of the production involving Joey Janela for Game Changer Wrestling, started with the WWE several weeks ago. Dittamo has worked previously with CZW and Championship Wrestling from Hollywood prior to working with Janela to produce and promote the first Spring Break card in 2017 over WrestleMania Weekend in Orlando. **A trial date of June 30th, 2020, has been set for the lawsuit filed by Jeff Jarrett against Anthem Wrestling Entertainment. In the 27-page filing that Mike Johnson at PWinsider.com has reported on, it is noted that Anthem was able to foreclose on their loan made to Impact Wrestling in 2016 to acquire control of the company. The loan was made to the prior management after funding from Billy Corgan was discontinued in October 2016. The discovery phase needs to be completed by next July. Anthem recently filed a response to the allegations made by Jarrett and can be read in Johnson’s report on the suit. **There is a casting call for a future episode of Total Bellas for a 21-35-year old male to play “Super Hot Male Model to play Centaur”. The model must be okay to be shirtless and to flirt with the female reality television talents. The shoot takes place this Sunday. The rate they are offering is $500 + 20%. **Game Changer Wrestling and FITE TV have announced that they will be donating 25% of the online pay-per-view from this Friday’s L.A. Confidential show to the victims of the Thousand Oaks shooting earlier this month. The card will be streaming for $13.99 (U.S.) this Friday at 10 pm Eastern. **Game Changer has also added a singles match between Tony Deppen and Jungle Boy, as a well as a six-person scramble match involving Jimmy Lloyd, Kikutaro, Chase Owens, Eli Everfly, Façade, and Delilah Doom to Friday night’s show. **The WWE has released the first episode of a new series called “Arrival” profiling Matt Riddle. The feature looks at Riddle’s arrival in August and his struggle getting to the WWE, the financial hardships of independent wrestling and how it affected his family. **The WWE stock closed at $68.10 on Thursday. **Nick Diaz is expected to fight in early 2019, ending a four-year hiatus from fighting, according to a report from Brett Okamoto at ESPN. The report states that Dana White has confirmed to ESPN that Diaz will return at UFC 235 on March 2nd to fight welterweight Jorge Masvidal. The contracts for the fight have not been signed, but the agreement is expected to be finalized soon. Diaz has not fought since January 2015 when he lost by decision to middleweight Anderson Silva at UFC 183. Masvidal is coming off two decision losses to Demian Maia and Stephen Thompson in 2017, which snapped a three-fight win streak. The undercard will feature 21-year old Khonry Gracie, the son of Royce, taking on the debuting Aaron Becker. This is Khonry’s second professional fight after losing his debut to Devon Brock by unanimous decision in January. **FloCombat reported first that featherweight Mirsad Bektic is off the UFC 231 card in Toronto next month where he was set to fight Renato Moicano. **Mike Perry did not break his arm during the fight with Donald Cerrone last Saturday in Denver. Perry posted an x-ray and noted that his original message that night was not accurate. Perry was scheduled for an MRI on Thursday to determine any ligament, tendon, and muscle damage to the arm. **The Nevada Athletic Commission has handed down a six-month suspension for UFC bantamweight Sean O’Malley following a positive drug test for ostarine. O’Malley was pulled from the UFC 229 due to the findings and he disclosed publicly why he was being taken off the card, which was his decision. O’Malley was given a reduced suspension based on taking responsibility for the finding and allowed the commission to use their discretion to reduce the suspension length. O’Malley will be tested three times in the month leading up to his next fight and USADA still must rule on the drug test failure. **GQ Australia has announced that UFC middleweight champion has been named their Sportsmen of the Year. **The Nevada Athletic Commission has extended the suspensions of Dillon Danis, Zubaira Tukhugov, and Abubakar Nurmagomedov for their roles in the brawl at UFC 229 following the Khabib Nurmagomedov and Conor McGregor fight in Las Vegas. The UFC removed Tukhugov from his fight with McGregor teammate Artem Lobovin New Brunswick last month consequently for his participation in the brawl, although he has not been released by the company. **Former UFC fighter Cody McKenzie has been suspended for four-years by the Nevada Athletic Commission after an attempt to provide a fake urine sample back in September. McKenzie was scheduled for a fight with the Tuff-N-Uff organization out of Las Vegas, but the fight was canceled when McKenzie tried to provide a fake sample. After being questioned about the sample, McKenzie eventually admitted to using a bottle containing urine substitute and provided the bottle that contained the same contents as his urine sample. McKenzie will also be required to cover the case fees of $944.84. McKenzie was undefeated when he joined Ultimate Fighter Season 12 and fought seven times for the organization after the season. After a 2-4 record in the UFC, which included fights with Yves Edwards, Chad Mendes, and Sam Stout, he left the organization and went 2-7 in his next nine fights through October 2017.